ADVECTION: The horizontal transport of air or atmospheric properties. Commonly used with temperatures, i.e., "warm air advection". ADVISORY: Advisories are issued for weather situations that cause significant inconveniences but do not meet warning criteria and, if caution is not exercised, could lead to life-threatening situations. Advisories are issued for significant events that are occurring, are imminent, or have a very high probability of occurrence. AIR MASS: A large body of air having similar horizontal temperature and moisture characteristics. ALBEDO: The percntage of light reflected by an object. ALTOCUMULUS: Mid-altitude clouds with a cumuliform shape. ALTOSTRATUS: Mid-altitude clouds with a flat sheet-like shape. ANEMOMETER: An instrument that measures wind speed. ANTICYCLONE: A large area of high pressure around which the winds blow clockwise in the Northern Hemisphere. ASOS: Automated Surface Observing System. Observes sky conditions, temperature and dewpoint, wind direction and speed, and barometric pressure. AVHRR: Advanced Very High Resolution Radiometer. Main sensor on U.S. polar orbiting satellites. AVN: Aviation Model generated every 12 hours by NCEP. AWIPS: Advanced Weather Information Processing System. New NWS computer system integrating graphics, satellite and radar imagery. The successor to AFOS. BACKING WINDS: A counterclockwise change in wind direction. Backing winds with height are indicative of cold air advection (CAA). BAR: An obstacle formed at the shallow entrance to the mouth of a river or bay. BAROMETER: An instrument for measuring atmospheric pressure. BLIZZARD: Snow with winds in excess of 35 mph and visibilities of 1/4 mile or less, for an extended period of time (eg. > 3 hours). BLOWING DUST: Reduction of visibility by strong winds blowing across dry ground with little or no vegetation. Visibilities of 1/8 mile or less over a widespread area are criteria for a Blowing Dust Advisory. BROKEN CLOUDS: Clouds which cover between 6/10 and 9/10 of the sky. CEILING: The height of the lowest layer of clouds, when the sky is broken or overcast. CHANCE: A 30, 40 or 50 percent chance of occurrence of measurable precipitation. CHINOOK WIND: A foehn wind on the east side of the Rocky Mountains. CIRRIFORM: High altitude ice clouds with a very thin wispy appearance. CIRROCUMULUS: Cirrus clouds with vertical development. CIRROSTRATUS: Cirrus clouds with a flat sheetlike appearance. CIRRUS: High clouds, usually above 18,000 feet, composed of ice crystals. CLEAR: Sky condition of less than 1/10 cloud coverage. CLIMATE: The historical record of average daily and seasonal weather events. CLOSED LOW: See Cutoff Low below. COASTAL FLOODING: The inundation of land areas along the coast caused by sea water above normal tidal actions. COASTAL FORECAST: A forecast of wind, wave and weather conditions between the coastline and 60 miles offshore. COLD FRONT: The boundary between a cold air mass that is advancing and a relatively warmer airmass. Generally characterized by steady precipitation followed by showery precipitation. COMBINED SEAS: The combined height of swell and wind waves. CONDENSATION: The process of gas changing to liquid. CONTINENTAL AIR MASS: A dry air mass originating over a large land area. CORIOLIS FORCE: An apparent force caused by the rotation of the Earth. In the Northern Hemisphere winds are deflected to the right, and in the Southern Hemisphere to the left. CUMULONIMBUS CLOUD (Cb): A vertically developed cloud, often capped by an anvil shaped cloud. Also called a thunderstorm cloud, it is frequently accompanied by heavy showers, lightning, thunder, and sometimes hail or gusty winds. CUMULUS CLOUD (Cu): A cloud in the shape of individual detached domes, with a flat base and a bulging upper portion resembling cauliflower. CUT OFF LOW: An area of low pressure cut off from its associated jet stream. CYCLONE: An area of low pressure around which winds blow counterclockwise in the Northern Hemisphere. Also the term used for a hurricane in the Indian Ocean and in the Western Pacific Ocean. DENSE FOG ADVISORY: Issued when fog reduces visibility to 1/8 mile or less over a widespread area. DEW: Moisture that has condensed on objects near the ground, whose temperatures have fallen below the dewpoint temperature. DEWPOINT: The temperature to which the air must be cooled for water vapor to condense. DIABLO WIND: Similar to Santa Ana winds in southern California. These winds occur below canyons in the East Bay hills (Diablo range) and in extreme cases can exceed 60 mph. They develop due to high pressure over Nevada and lower pressure along the central California coast. DOPPLER RADAR: A type of weather radar that determines whether atmospheric motion is toward or away from the radar. It uses the Doppler effect to measure the velocity of particles suspended in the atmosphere. DOWNBURST: A severe localized downdraft from a thunderstorm. DRIZZLE: Small, slowly falling water droplets, with diameters between .2 and .5 millimeters. DUST DEVIL: A small, rapidly rotating wind that is made visible by the dust, dirt or debris it picks up. Also called a whirlwind, it develops best on clear, dry, hot afternoons. EBB CURRENT: Movement of a tidal current away from shore or down a tidal river or estuary. ECMF: European Centre for Meteorology Forecast model. EL NIÑO: A major warming of the equatorial waters in the Pacific Ocean. El Niño events usually occur every 3 to 7 years, and are characterized by shifts in "normal" weather patterns. FAIR: Less than 4/10 opaque cloud cover, no precipitation, and no extremes in temperature, visibility or winds. FETCH: The area in which ocean waves are generated by the wind. Also refers to the length of the fetch area, measured in the direction of the wind. FLASH FLOOD: A flood that occurs within a few hours (usually less than six) of heavy or excessive rainfall, dam or levee failure. FLOOD: High flow, overflow or inundation of a normally dry area which causes or threatens damage. FLOOD STAGE: The level of a river or stream at which considerable inundation of surrounding areas will occur. FOËHN: A warm dry wind on the lee side of a mountain range. The heating and drying are due to adiabatic compression as the wind descend downslope. FOG: The visible aggregate of minute water droplets suspended in the atmosphere near the earth's surface. Essentially a cloud whose base is at the earth's surface, limiting visibility. FREEZING LEVEL: The altitude in the atmosphere where the temperature drops to 32F. FREEZING RAIN: Rain which falls as liquid then freezes upon impact, resulting in a coating of ice on exposed objects. FRONT: The transition zone between two distinct airmasses. The basic frontal types are cold fronts, warm fronts and occluded fronts. FROST: The covering of ice that is formed on exposed surfaces whose temperature falls below freezing. FUJITA SCALE: System developed by Dr. Theodore Fujita to classify tornadoes based on wind damage. Scale is from F0 for weakest to F5 for strongest tornadoes. FUNNEL CLOUD: A rotating, cone-shaped column of air extending downward from the base of a thunderstorm. When it reaches the ground it is called a tornado. GALE: Wind speeds from 39 to 54 mph (34 to 47 knots). GEOSTATIONARY SATELLITE: A satellite that rotates at the same rate as the earth, remaining over the same spot above the equator. GFS: Global Forecast System. Successor to Aviation and MRF models run by NCEP four times a day out to 384 hours. GREENWICH MEAN TIME (GMT): Time standard based upon the Prime Meridian and used for most meteorological applications and activities. See UTC and ZULU. GREENHOUSE EFFECT: The warming of the atmosphere by the trapping of longwave radiation being radiated to space. The gases most responsible for this effect are water vapor and carbon dioxide. GROUND FOG: Fog produced over the land by the cooling of the lower atmosphere as it comes in contact with the ground. Also known as radiation fog, and in parts of California as tule fog. GUST: A brief sudden increase in wind speed. Generally the duration is less than 20 seconds and the fluctuation greater than 10 mph. GUST FRONT: The leading edge of the downdraft from a thunderstorm. HAIL: Precipitation in the form of balls or irregular lumps of ice. HALOS: Rings or arcs that seem to encircle the sun or moon. They are caused by the refraction of light through the ice crystals in cirrus clouds. HAZE: Fine dry or wet dust or salt particles in the air that reduce visibility. HIGH: The center of an area of high pressure, usually accompanied by anticyclonic and outward wind flow. Also known as an anticyclone. HIGH WIND: Sustained winds greater than or equal to 40 mph or gust greater than or equal to 58 mph. HUMIDITY: The amount of water vapor in the atmosphere. (See relative humidity). HURRICANE: A severe tropical cyclone with wind speeds in excess of 74 mph (64 knots). INDIAN SUMMER: An unseasonably warm period near the middle of autumn, usually following a substantial period of cool weather. INSIDE SLIDER: A shortwave trough moving southward along the eastern side of a ridge of high pressure usually responsible for cool breezy and sometimes showery weather. INVERSION: An increase in temperature with height. The reverse of the normal cooling with height in the atmosphere. ISOBAR: A line of equal barometric pressure on a weather map. ITCZ: Inter-tropical Convergence Zone. The region where the northeasterly and southeasterly tradewinds converge, forming an often continuous band of clouds or thunderstorms near the equator. JET STREAM: Strong winds concentrated within a narrow band in the atmosphere. The jet stream often "steers" surface features such as front and low pressure systems. KATABATIC WIND: Local winds a result of cold, dense air flowing downhill. KNOT: One nautical mile per hour (1.15 mph). LAND BREEZE: A wind that blows from the land towards a body of water. Also known as an offshore breeze. LA NIÑA: A cooling of the equatorial waters in the Pacific Ocean. LAPSE RATE: The change in temperature with altitude in the atmosphere. LIGHTNING: An electrical discharge from a thunderstorm. LIKELY: In probability of precipitation statements, the equivalent of a 60 or 70 percent chance. LOW: The center of an area of low pressure, usually accompanied by cyclonic and inward wind flow. Also known as a cyclone. MAR: Modernization and Associated Restructuring of the NWS. MACROBURST: Large downbursts with a 2.5 mi or greater outflow diameter and damaging winds lasting 5 to 20 minutes. MARITIME AIR MASS: Moist air mass originating over the ocean. METEOROLOGY: The study of the atmosphere and atmospheric phenomena. MICROBURST: A strong localized downdraft from a thunderstorm with peak gusts lasting 2 to 5 minutes. MILLIBAR: A unit of atmospheric pressure. 1 mb = 100 Pa (pascal). Normal surface pressure is approximately 1013 millibars. MONSOON: A persistent seasonal wind, often responsible for seasonal precipitation regime. MRF: Medium Range Forecast model generated every 12 hours by NCEP. MSLP: Mean sea level pressure. NCDC: National Climatic Data Center. Located in Asheville, North Carolina, the agency that archives climatic and forecast data from the National Weather Service. NCEP: National Centers for Environmental Prediction. Central computer and communications facility of the National Weather Service; located in Washington, DC. NEXRAD: NEXt Generation RADar. A NWS network of about 140 Doppler radars operating nationwide. NGM: Nested Grid Model generated every 12 hours by NCEP. NHC: National Hurricane Center. The office of the National Weather Service in Miami that is responsible for tracking and forecasting tropical cyclones. NOAA: National Oceanic and Atmospheric Administration. A branch of the US Department of Commerce, NOAA is the parent organization of the National Weather Service. NOAA WEATHER WIRE (NWWS): Mass dissemination via satellite of National Weather Service products to the media and public. NUMERICAL WEATHER PREDICTION (NWP): Forecasting weather by the use of numerical models, run on high speed computers. Most of the NWP for the National Weather Service is done at the National Centers for Environmental Prediction (NCEP). OCCLUDED FRONT: A complex frontal system that occurs when a cold front overtakes a warm front. Also known as an occlusion. OFFSHORE BREEZE: A wind that blows from the land towards a body of water. Also known as a land breeze. OFFSHORE FORECAST: A marine weather forecast for the waters between 60 and 250 miles off the coast. OMEGA: A term used to describe vertical motion in the atmosphere. The "omega equation" used in numerical weather models is composed of two terms, the "differential vorticity advection" term and the "thickness advection" term. Put more simply, omega is determined by the amount of spin (or large scale rotation) and warm (or cold) advection present in the atmosphere. On a weather forecast chart, high values of omega (or a strong omega field) relate to upward vertical motion in the atmosphere. If this upward vertical motion is strong enough and in a sufficiently moist airmass, precipitation results. ONSHORE BREEZE: A wind that blows from a body of water towards the land. Also known as a seabreeze. OROGRAPHIC UPLIFT: The vertical forcing of air by terrain features such a hills or mountains. This can create orographic clouds and/or precipitation. OUTFLOW: Air that flow outward from a thunderstorm. OVERCAST: Sky condition when greater than 9/10 of the sky is covered. OZONE: A form of oxygen containing 3 molecules, usually found in the stratosphere, and responsible for filtering out much of the sun's ultraviolet radiation. PACIFIC HIGH: A semipermanent anticyclone located in the Eastern North Pacific. PARTLY CLOUDY: Sky condition when between 3/10 and 7/10 of the sky is covered. PRECIPITATION: Liquid or solid water molecules that fall from the atmosphere and reach the ground. PRESSURE: The force exerted by the interaction of the atmosphere and gravity. Also known as atmospheric pressure. PTWC: Pacific Tsunami Warning Center, located in Honolulu, HI. RADIATION FOG: See ground fog. RADIOSONDE: An instrument attached to a weather balloon that transmits pressure, humidity, temperature and winds as it ascends. RAIN: Liquid water droplets that fall from the atmosphere, having diameters greater than drizzle. RAINBOW: Optical phenomena when light is refracted and reflected by moisture in the air into concentric arcs of color. RELATIVE HUMIDITY: The amount of water vapor in the air, compared to the amount the air could hold if it was totally saturated. (Expressed as a percentage). REX BLOCK: A blocking pattern where there is an upper level high located directly north of a closed low. RIDGE: An elongated area of high pressure in the atmosphere. RUC: Rapid Update Cycle model generated every 3 hours. SANTA ANA WINDS: Relatively warm, dry winds that blow into Southern California coastal areas from an anticyclone located over the high deserts of California or Nevada. The warmth and dryness are due to compressional heating. See also Diablo winds. SCATTERED CLOUDS: Sky condition when between 1/10 and 5/10 are covered..
SEA BREEZE: A wind that blows from a sea or ocean towards a land mass. Also known as an onshore breeze. SEA SURFACE TEMPERATURE (SST): Surface temperature data collected using IR satellite imagery, buoy and ship data. SEVERE THUNDERSTORM: A strong thunderstorm with wind gusts in excess of 58 mph (50 knots) and/or hail with a diameter of 3/4" or more. A thunderstorm with winds greater than 39 mph and/or hail greater than « inch is defined as approaching severe. SHOWER: Precipitation that is intermittent, both in time, space or intensity. SLEET: A type of frozen precipitation, consisting of small transparent pellets. SLIGHT CHANCE: In probability of precipitation statements, usually equivalent to a 20 percent chance. SMALL CRAFT: Generally a vessel under 65 feet in length. SMALL CRAFT ADVISORY: Winds in excess of 22 knots (25 mph), and less than 34 knots (39 mph), that may cause hazardous conditions for operators of small vessels. SMOG: Pollution formed by the interaction of pollutants and sunlight (photochemical smog), usually restricting visibility, and occasionally hazardous to health. SNOW: Frozen precipitation composed of ice particles in complex hexagonal patterns. SNOW ADVISORY: An advisory issued when snow is expected to create hazardous or restricted travel conditions, but not as severe as expected with a winter storm. SNOW FLURRIES: Light snow showers, usually of an intermittent nature with no measurable accumulation. SOUTHERN OSCILLATION: A periodic reversal of the pressure pattern across the tropical Pacific Ocean during El Nino events. SPC: Storm Prediction Center. Located in Norman, OK. This office is responsible for monitoring and forecasting severe convective weather in the continental U.S. This includes the issuance of Tornado and Severe Thunderstorm Watches. SPRING TIDE: Semi-monthly tide of increased height due to the new or full moon. SQUALL LINE: A non-frontal band, or line, of thunderstorms. STATIONARY FRONT: A transition zone between airmasses, with neither advancing upon the other. STORM: In marine usage, winds 48 knots (55 mph) or greater. STORM SURGE: A rise of the sea, preceding a storm (usually a hurricane) due to the winds of the storm and low atmospheric pressure. STRAIGHT LINE WINDS: Thunderstorm winds most often found with the gust front. They originate from downdrafts and can cause damage which occurs in a "straight line", as opposed to tornadic wind damage which has circular characteristics. STRATUS: Very flat low level clouds. SUBSIDENCE: Sinking air that is associated with warming air and little cloud formation. SUBTROPICAL JET: The branch of the jet stream that is found in the lower latitudes. SUSTAINED WINDS: The wind speed obtained by averaging the observed values over a one minute period. SWELLS: Ocean waves of regular and longer duration than wind waves. THERMAL: Small rising column of air due to surface heating. THICKNESS: The height difference between two atmospheric pressure levels and is related to the average temperature in the column. THUNDER: The sound caused by a lightning stroke as it heats the air and causes it to rapidly expand. THUNDERSTORM: A storm with lightning and thunder, produced by a cumulonimbus cloud, usually producing gusty winds, heavy rain and sometimes hail. TORNADO: A violent rotating column of air, in contact with the ground, pendant from a cumulonimbus cloud. A tornado does not require the visible presence of a funnel cloud. TRADE WINDS: Persistent tropical winds that blow from the subtropical high pressure centers towards the equatorial low. TROPICAL DEPRESSION: Tropical mass of thunderstorms with a cyclonic wind circulation and winds between 20 and 34 knots. TROPICAL DISTURBANCE: An organized mass of tropical thunderstorms, with a slight cyclonic circulation, and winds less than 20 knots. TROPICAL STORM: An organized cyclone in the tropics with wind speed between 35 and 64 knots. TROUGH: An elongated area of low pressure at the surface or aloft. TSUNAMI: An ocean wave generated by a submarine earthquake, volcano or landslide. (Also known as a seismic sea wave, and incorrectly as a tidal wave). TULE FOG: Radiation fog in the Central Valley. It forms during night and morning hours in late fall and winter months following the first significant rainfall. A leading cause of weather related casualties in California. TURBULENCE: Disrupted flow in the atmosphere that produces gusts and eddies. TYPHOON: A hurricane that forms in the Western Pacific Ocean. UTC: In 1970 the Coordinated Universal Time system was devised by an international advisory group of technical experts within the International Telecommunication Union (ITU). The ITU felt it was best to designate a single abbreviation for use in all languages in order to minimize confusion. Since unanimous agreement could not be achieved on using either the English word order, CUT, or the French word order, TUC, the acronym UTC was chosen as a compromise. UKMET: United Kingdom forecast model. UPWELLING: The rising of cold water from the deeper areas of the ocean to the surface. This phenomena often occurs along the California coast during the summer. VEERING WINDS: A clockwise change in wind direction. Veering winds with height are indicative of warm air advection (WAA). VIRGA: Precipitation falling from the base of a cloud and evaporating before it reaches the ground. VISIBILITY: The horizontal distance an observer can see and identify a prominent object. VORTICITY: A measure of the amount of "spin" (or rotation) in the atmosphere. WARM FRONT: A boundary between a warm airmass that is replacing a cooler airmass. WARNING STAGE: The level of a river or stream which may cause minor flooding, and at which concerned interests should take action. WARNING: Forecast issued when a particular hazard is "imminent" or already occurring (e.g., tornado warning, flash flood warning). WATCH: Forecast issued well in advance to alert the public of the possibility of a particular hazard (eg. tornado watch, flash flood watch). WATERSPOUT: A column of rotating air over a body of water (ie. a tornado over the water). WIND ADVISORY: Sustained winds 25 to 39 mph and/or gusts to 57 mph. Issuance is normally site specific. However, winds of this magnitude occurring over an area that frequently experiences such winds (e.g., the normal strong summertime winds near the San Francisco Bay) would not require the issuance of this product). WIND SHEAR: The change of wind speed or direction with distance, usually vertical. WIND VANE: An instrument that determines the direction from which a wind is blowing. WIND WAVES: Short period and irregular waves created by the flow of air over the water. WIND CHILL FACTOR: The amount of cooling one "feels" due to the combination of wind and temperature. The formula to calculate wind chill is: WC=.0817(3.71 V^.5 + 5.81 - .25 v)(T-91.4)+91.4 where V=wind speed in MPH and T=temperature F.
WINTER STORM: A heavy snow event. ZULU: Equivalent to UTC or Greenwich Mean Time (GMT). 1 Original version of this glossary was developed by the author, Jan Null, 1996. 2 Current update February 2003. 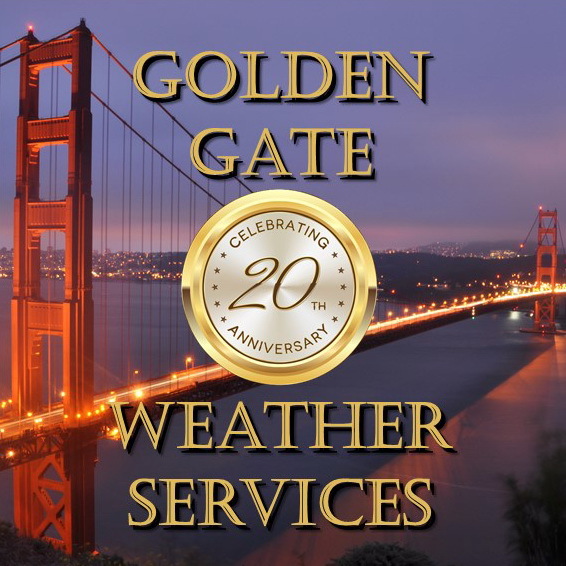 Copyright © 2003, Golden Gate Weather Services. Reproduction in full or part is prohibited without permission.